(Nanowerk News) Scientists from the Kurchatov Institute, Moscow Institute of Physics and Technology (MIPT), the University of Parma (Italy), Moscow State University, and Saint Petersburg State University have created a neural network based on polymeric memristors – devices that can potentially be used to build fundamentally new computers. According to the researchers, these developments will primarily help in creating technologies for machine vision, hearing, and other machine sensory systems, and also for intelligent control systems in various fields of applications, including autonomous robots. The authors of the new study focused on a promising area of neural networks realized in hardware on polymer-based memristors. The experiments conducted at the Complex for Nano-, Bio-, Information, Cognitive and Socio-Humanitarian Sciences and Technologies (NBICS-Complex) at the Kurchatov Institute by a joint team of Russian and Italian scientists demonstrated that it is possible to create very simple polyaniline-based neural network, so-called elementary perceptron (Organic Electronics, "Hardware elementary perceptron based on polyaniline memristive devices"). Furthermore, this network is able to learn and perform specified logical operations. A memristor is an electric element similar to a conventional resistor. The difference between a memristor and a traditional element is that the electric resistance in a memristor is dependent on the charge passing through it. Therefore, it constantly changes its properties under the influence of an external signal: a memristor has a memory and at the same time is also able to change the data encoded in its resistance! In this sense, a memristor is similar to a synapse, i.e. a connection between two neurons in the brain that is able, with a high level of plasticity, to modify the efficiency of signal transfer between neurons under the influence of the transfer itself. A memristor enables scientists to build a “true” neural network, and the physical properties of memristors mean that at the very minimum the neural networks based on memristors potentially can be made as small as conventional chips. The polyaniline (plastic material) was not chosen by chance. Previous studies demonstrated that it can be used to create individual memristors, so the scientists did not have to go through many different materials. 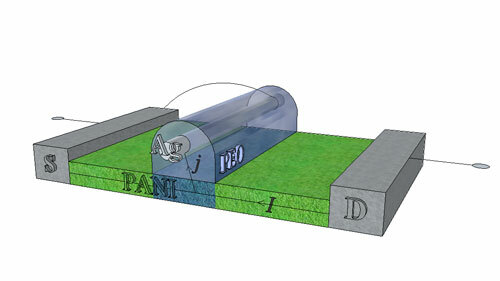 Using a polyaniline solution, a glass substrate, and chromium electrodes, they created a prototype with dimensions that, at present, are much larger than those typically used in conventional microelectronics: the strip of the structure was approximately one millimeter wide (they decided to avoid miniaturization for the moment). All of the memristors were tested for their electrical characteristics: it was found that the current-voltage characteristic of the devices is in fact non-linear, which is in line with expectations. The memristors were then connected to a single-layer neuromorphic network (i.e. with the one layer of memristive synapses and neurons connected to them). A current-voltage characteristic (or IV curve) is a graph where the horizontal axis represents voltage and the vertical axis is a current. For a conventional resistance, the IV curve is a straight line, in a strict accordance with Ohm’s Law: a current is proportional to a voltage. For a memristor, however, it is not just the voltage that is important, but also the time of its application. That is why, if you begin to gradually increase the voltage supplied to the memristor, it will increase the current passing through it not in a linear fashion, but with a gradual bend to the bigger current values in the graph, meaning that at a certain point its resistance will begin to fall. Then if you begin to reduce the voltage, the memristor will remain in its conducting state for some time, after which it will gradually change its resistance again but at this time to decrease its conductivity. These features cause the IV curve to be some kind of hysteresis loop that do mean the memristor has the memory of its past conductivity state. After checking the basic properties of individual memristors, the physicists conducted experiments to train the neural network. The training (it is a generally accepted term and is therefore written without inverted commas) involves applying electric pulses to the inputs of the perceptron. If a certain combination of electric pulses is applied to inputs of the perceptron (e.g. a logic one and a logic zero at two inputs) and it gives the wrong answer on its output, the special correcting pulses are applied to it, and after a certain number of repetitions all the internal parameters of the device (namely memristive resistances) are become reconfigured, i.e. “trained” to give the correct answer. The scientists demonstrated that after about a dozen corrections their new memristive network was capable of performing a NAND logical operation, and then it was also able to learn to perform a NOR operation. Since it is an operator or a classical computer that is used to check for the correct answer, this method is called the supervised learning. Needless to say, the elementary perceptron of macroscopic dimensions with a characteristic reaction time of tens or hundreds of seconds is not the element that is ready for commercial production. However, as the researchers note themselves, their creation was made using inexpensive materials, and the reaction time will decrease as the size will be reduced: the first prototype was intentionally enlarged to make the work easier; it is physically possible to manufacture more compact chips. In addition, polyaniline can be used in attempts to make a three-dimensional structure by placing the memristors on top of one another in a multi-tiered structure (e.g. in the form of random intersections of the thin polymer fibers), whereas modern silicon microelectronic systems, due to a number of technological limitations, are two-dimensional. The transition to the third dimension would potentially offer many new opportunities. What does 'fundamentally different computers' mean? The common classification of computers is based either on their casing (desktop/laptop/tablet), or on the type of operating system used (Windows/MacOS/Linux). However, this is only a very simple classification from a user perspective, whereas specialists normally use an entirely different approach that is based on a principle of organizing computer operations. The computers that we are used to, whether they be tablets, desktop computers, or even on-board computers on spacecraft, are all devices with von Neumann architecture. Without going in too much detail, they are devices based on physically separated processors and blocks of memory (RAM and ROM). The memory stores the code of a program that is to be executed. A program is a set of instructions that contain the certain operations to be performed with data. Data are also stored in the memory and are retrieved from it (and also written to it) in accordance with the program; the program instructions are performed by the processor. There may be several processors, they can work in parallel, data can be stored in a variety of ways, but there is always a fundamental division between the processor and the memory. Even if the computer is integrated into a one single chip, it will still have separate elements for processing of an information and separate units for storing data. At present, all modern microelectronic systems are based on this particular principle and this is partly the reason why most people are not even aware that there may be other types of computer systems – without separate processors and memory. However, such systems do exist. Furthermore, if you look at the brain itself as a computer system (this is purely hypothetical at the moment: it is not yet known whether the function of the brain is reducible to computations), then you will see that it is not built like a computer with von Neumann architecture. Neural networks do not have a specialized processor or separate memory cells. Information is stored and processed in each and every neuron and its synapses, one element of the computer system, and the human brain has approximately 100 billion of these elements. In addition, almost all of them are able to work in parallel (simultaneously), which is why the brain is able to process information with great efficiency and at such high speed. Artificial neural networks that are currently implemented on von Neumann computers only emulate these processes. Emulation, i.e. a step by step imitation of functions inevitably leads to a decrease in speed and an increase in energy consumption. In many cases this is not so critical, but in certain cases it can be. Devices that do not simply imitate the function of neural networks, but are fundamentally the same could be used for a variety of tasks. One of the most prominent and technically developed example is that neural networks are capable of pattern recognition. They are used as a basis for recognising handwritten text for example, or signature verification. When a certain pattern needs to be recognised and classified, such as a sound, an image, or characteristic changes on a graph, neural networks are actively used and it is in these fields where gaining an advantage in terms of speed and energy consumption is critical. In a control system for an autonomous flying robot every milliwatt-hour and every millisecond counts, just in the same way that a real-time system to process data from a collider detector cannot take too long to “think” about highlighting particle tracks that may be of interest to scientists from among a large number of other recorded events.